"An evening of chamber music is always an intimate event, a visual feast and symphony for the senses. The barn owl evokes the dreamlike quality of a nocturne. The beating wings capture the movement of the musicians and their instruments. The curve of the cello scroll reminds me of the human form. I wanted this piece to capture the moment of anticipation as the audience awaits, the musicians raise their bows and the music begins." Shannon Troxler continues to change and evolve as an artist, exploring new mediums and subjects such as encaustics and oil on gold leaf. Shannon is inspired by the beauty of the natural world , she attempts to capture the essence of her subject and distill it through the lens of memory and her own experience. Shannon is a graduate of the Schuler School of Fine Art in Baltimore, Maryland and she also attended the Art Students League in New York City. She has had numerous solo exhibits in Jackson and on the east coast, including shows at the Kimball Art Center and the Samuel Morse Museum in New York. Her work has been in several prestigious national shows, including “Birds in Art”, Arts for the Parks, The Governor’s Capitol Art Exhibit and the Salmagundi Club , her work is also in the permanent collection of The Wyoming State Museum in Cheyenne. "The title comes from a description of the original Martha Graham dance piece set to the music for which Appalachian Spring was composed. The main couple in the story was said to be "ruminating" on their past and the coming future of their home in the west. I wanted the feeling of that story coming out - even if only slightly - the old table the cranes sit on - the sharp line of the wooden window frame. Outside the window - the scenery is painted in a totalistic style and looser brush strokes - more dream-like. The inside is sharper lines, more direct - the reality in which the music exists but outside the window is the world the music creates. The cranes are from left to right: piano, flute, violin parts from the score." Todd Kosharek received his BA in Art History from the University of Wisconsin – Milwaukee focusing his attention on eighteenth to twentieth century painting. Through these studies, he learned various approaches to technique, color theory, composition, as well as the importance of art with in the fabric of society through out the ages. This understanding has been an important factor in his choice of subject matter. Todd studies art history while painting full time in his home studio in Jackson, Wyoming, where he has lived since 2000. He regularly takes portrait commissions and paints Wyoming landscapes. In 2007 he started his series of paintings exploring the symbolic qualities of the origami paper crane for which he is best known. 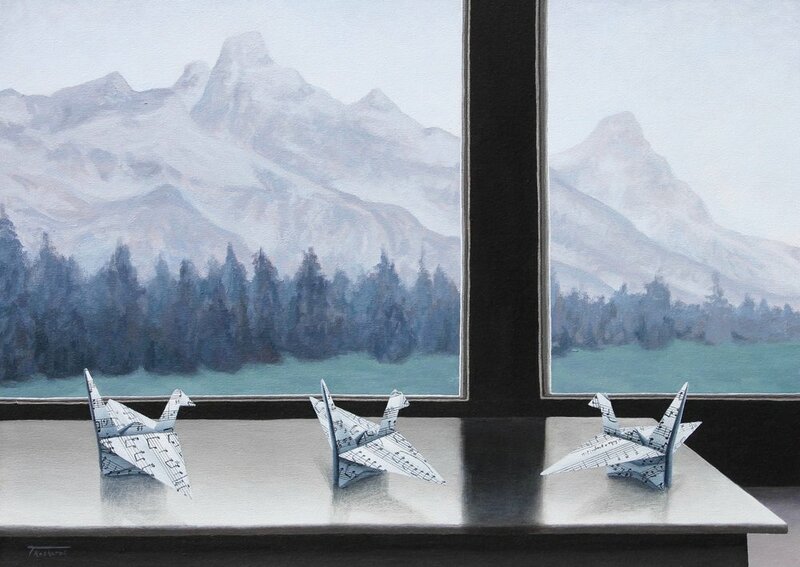 The Origami Crane Series is an on-going collection of interior paintings exploring the Japanese prayer tradition of folding 1,000 cranes. These paintings are contemplations on memory, place, and time. He has also explored the concept of the origami crane as a universally accepted symbol of peace in his on-going “Project” series. Todd has work in private and public collections through out the United States and in Paris, France. His work is represented by Altamira Fine Art in Jackson, WY and Scottsdale, AZ.